There are tiny little irrelevant markets everywhere like pot stocks and cryptocurrency. These could disappear tomorrow and it won’t matter in grand scheme of things. The sovereign wealth funds, hedge funds, and other monster institutions that make markets move have to be making plays in the bond market. They’re too big not to be. If you want an inside look at the money flow from one place to another, an “intermarket” approach really helps. I’ve been a lonely stock market bull for most of this year. It feels like every time I’ve told people that I think we’re closer to the beginning of a bull market than the end, they think I’m crazy. That reaction has gotten me even more bullish. Not only does price continue to suggest we’re heading much higher, but sentiment and positioning points toward the same. I’ve made the argument that technology is going to take us much higher, as it is just now finally breaking out above the March 2000 highs. It took 17 years to digest those 1990s gains. We’re now just moving on. All that market cap getting going is one obvious catalyst that I’ve been talking about since last year. Another big one is the bond market. If interest rates get going, selling in bonds is likely to continue. That money needs a home. And stocks and commodities are likely it. First, let’s see what rates themselves are signaling before making plans on what to do. Let’s start with the U.S. 10-year yield. This month marks the 37th anniversary of the high in rates in 1981, about five months before I was born. What if those 2016 lows were it? Was that whipsaw below the previous lows the catalyst to send rates higher towards 4%? I think it absolutely can be. But the one thing we do know is that we have to get through 3% before getting to 4%. If we’re holding above 3% that means we’re above the early 2014 highs and above this 37-year downtrend line. A breakout could spark a straight shot to 4%, which is the 161.8% extension of the 2014 to 2016 decline and a logical target. 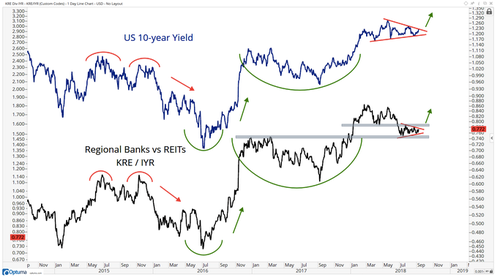 To continue with this intermarket theme, the cross-asset analysis, here’s a closer look at the U.S. 10-year yield but with an important ratio overlaid: Regional Banks versus REITs. When the market believes rates are going higher, money flows faster into regional bank stocks than into higher yielding Real Estate Investment Trusts (REITs). With higher rates, there’s less of a need for fixed income investors to get their yield in the stock market. We’re seeing this play out in bond prices as well. 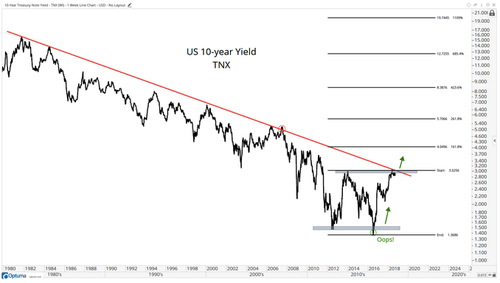 Let’s look at the “stocks versus bonds” ratio breaking out to new all-time highs. 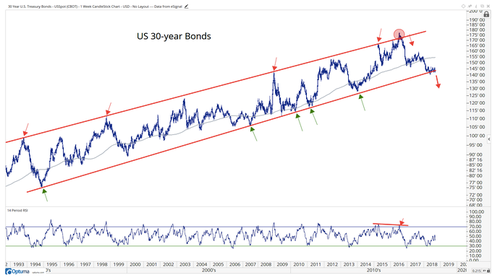 Now let’s look at the long-term chart of 30-year bond futures. Trends are rarely this perfect for so long. 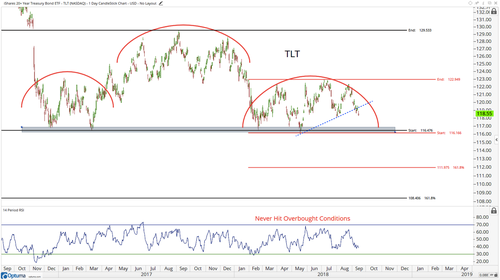 In the first chart of this letter, you could see the U.S. 10-year put in a failed breakdown, or whipsaw, in the summer of 2016. That sparked a ripper and could be the catalyst to send it through 3% towards 4%. The 30-year bonds put in a similar whipsaw, failing to break out above the upper end of this historic channel. The U.S. 30-years are flirting with an epic breakdown and it’s one we’re certainly watching. A big break is likely to come with rates heading towards 4% in 10-years. One of the things I like to do is flip charts upside down to get a view with less bias. Why would rates go up? One reason would be to price in higher inflationary forces. 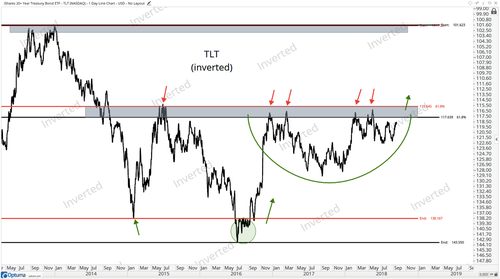 We’re getting close to achieving the next target in this ratio, which means that commodities could be at a turning point to where some outperformance is likely starting at some point in the coming months. It does not necessarily mean that stocks will fall. 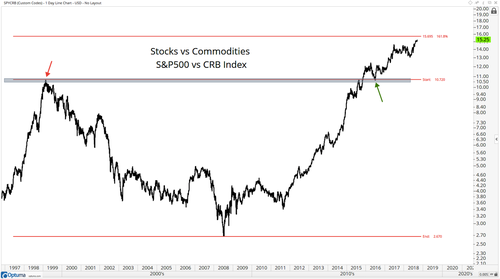 Just that both stocks and commodities could rise together with commodities finally showing some relative strength for a while. 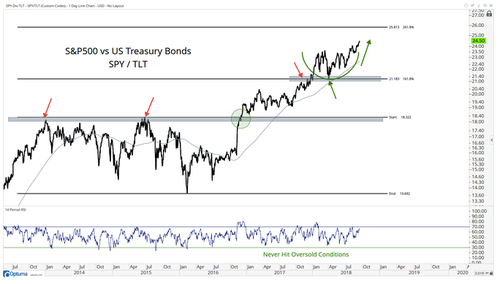 A rising rate environment where bond prices are falling and stocks and commodities are going up are conditions where I want to be buying stocks. Now let’s remember, this 161.8% extension plotted above in the stocks versus commodities ratio could come into play, or it could not. The purpose of this exercise is to imagine what the world would look like in six months and what things would look like if we’re right, and what they would look like if we’re wrong. The reason is so that when we see certain things developing, it either confirms our thesis or disproves it, and we’ll know early either way. The bottom line is that rates have to get through 3% before going to 4%. We’re right there. If we’re above 3% we want to be shorting bonds. Whether that is through an ETF, options or futures, pick your poison. We’re also using this possibility for information purposes. I think higher rates is a positive for bank stocks and the market overall, at least for now. After 4% to 5% in 10-years, historically things get a little shaky for stocks. But let’s be serious, we’re nowhere near that. For now, I think higher rates are good for stocks. What do you think? Email me at bigmarketrends@charlesstreetresearch.com.